Happy Monday everyone! I hope this post finds you on vacation to an idyllic seaside paradise. Speaking of which, I am still in Mykonos that is crowded as ever! My life lately revolves around my job and some amazingly exciting plans that we have with Anestis and can’t wait to share with you! So here is another weekly update. As the day of returning to Paris approaches, and I miss it like ever before, I listen a lot to Yann Tiersen and Ibrahim Maalouf, two of my favorite musicians and composers. Their music is the soundtrack of that city for me. 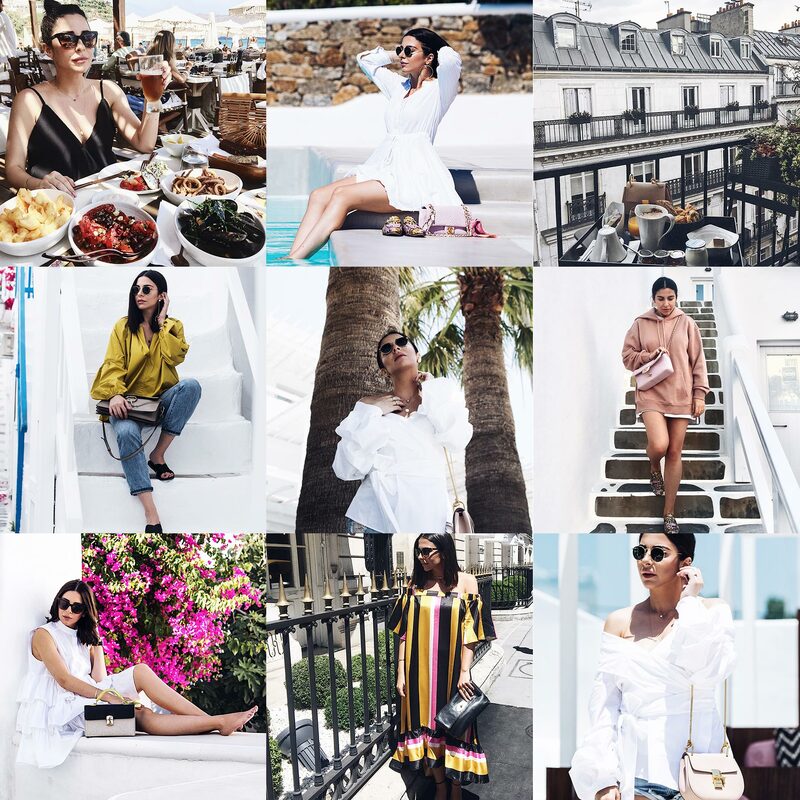 My one-day visit for PFW last month was like a breath of fresh air, despite the rush and heat wave! In case you don’t follow me on Instagram already, I went to PFW for Versace day. I attended a scheduled private presentation of their new haute couture collection, at their atelier in avenue Montagne, followed by the Versace party at L’Arc club in the evening. It was so nice to be back there were we had our wedding party exactly four months ago! I had an amazing time and the chance to see some friends that I’d missed. I am currently doing a F. Nietzsche recap of my favourite of his books and scripts, in hopes to have time to finish most of them (not much likely). For a lighter summer reading, I recommend ‘The Dinner’ by Herman Koch, a complex and intelligent talky drama that made me read it in one day! I am completely in love with this new beauty product that I finally tried, the Glamour Shot by Sampar. It’s a transparent foundation that corrects pores and redness in just a few seconds. It feels super light, nothing like a makeup, although it acts like one, with a 100% natural result. I mean how cool is that? The only problem is you will never want to use makeup again. Try it asap! With my new Macbook Pro. It’s been a long time that my old Macbook Pro was slowly dying, and recently flat-lined. I am ecstatic of how faster and easier I can do everything again. And for being able to work from my bed, my swimming pool and anywhere else I feel like, instead of being chained in the office all day long. #firstworldproblems I know. I am currently counting days to go back to Paris. We have so many plans there that I really can’t wait to put in action and of course to share with you guys. You know how much I love to involve you around anything we do. 🙂 We will be there by end of September. I am grateful for another successful season in my business, even if this means I am the whitest person in Mykonos (I’ve only been to the beach once!). This will allow us to take it one step further next year by following the necessary moves that are already planned. The crazy part of the work is almost over, and I am also grateful for having now more time for my blog and personal life. I am currently trying to mix it up with my summer wardrobe, as I am wearing whites most of my time, I got these unusual for me colourful dresses from Asos, as well as a few black dresses and absolutely love the change! I also finally received my Cult Gaia bag that has become the extension of my hand lately. It’s the ultimate summer bag and goes with every look! What about you? Any style update recently? Hope you enjoyed this weekly update and I look forward to read your news at the comments below. Thanks for stopping by and have an amazing week and vacation! Grateful to be with you!!! I hope you had a great week and I love all these looks! Oh, a fan of Nietzsche! Nice to meet you! Congrats for being more efficient at work with your new Macbook Pro. I had an upgrade too and I know what you mean! Totally in love with Top 1. Enjoy the rest of your vacation. Sounds like you had a fantastic time in Mykonos. Enjoy your time in Mykonos honey, and you’re so lucky to be flying to Paris soon! I was there last winter and already miss that city so much. Look how beautiful you are, as always, those tops are gorgeous and chic. And I love how you commented on my blog. Your outfits are so stylish dear! Hope you are having fun in Mykonos! Have Monday babe! I love all these outfits – they’re so chic and gorgeous. My favorite is Top 3. Have a wonderful week. Hi Stella, I checked out your work website and I will keep this in mind. The transparent foundation seems to be a good thing. Love that beautiful white top! I am obsessed with every outfit of yours, you look so gorgeous! And Mykonos looks incredible! I love your white top,Stella. But I`m in love with your tiered shirt dress even more. What is your secret of keeping them soo white? necessary foodstuffs, and catching up with friends here. What a great post – you look stunning! Everyone seems to be going to Mykonos this summer!